A Bird Hunter's Thoughts: Finally, a good solution! 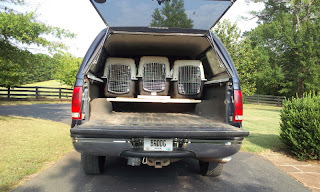 Since installing my topper, I wanted to have a 3- holer dog box. Manufactured dog boxes not only were $800-$1000, but they would take 2-3 weeks to manufacture. I realized that by installing them in this fashion, I not only kept the dogs secure, but I can offload these boxes and use them at any time for other uses. I don't need water tight, since they are under the shell. Now, I have storage underneath, too. We'll see how this works out.